- Antique print, titled: 'Wilhelmo Henrico Principlauriacum ob Fugatos Hostes et Rempublicam Restitutam. ', (To William Henry . for putting the enemy to flight and saving the state.) 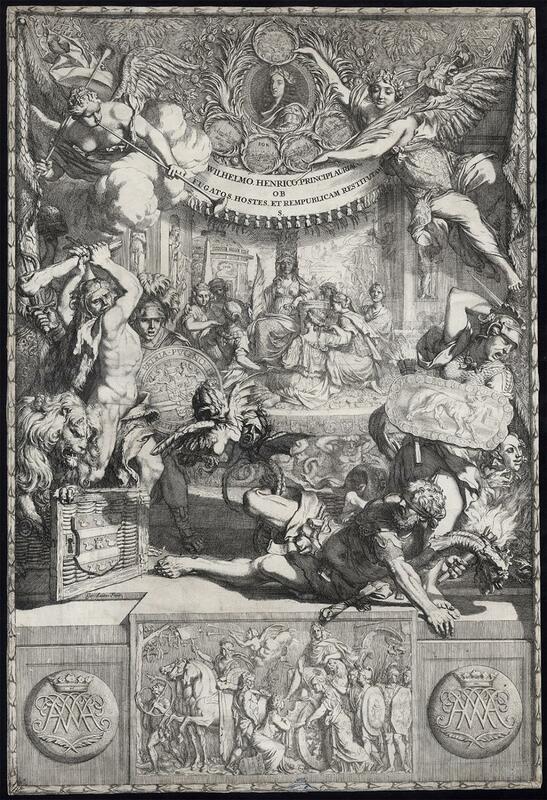 Allegory in honour of William III, Prince of Orange, after his victorious campaign of 1673. Figure of Hercules to the left and of the Maid of the Netherlands in the middle, who is surrounded by the 7 Maids of the Provinces. Medallions with conquered cities: Grave, Naarden, Bonn, Lessenich. Etching on a verge type hand laid paper. Description: Artists and Engravers: Made by an anonymous engraver after Ger. Laires Fecit. Gerard de Lairesse (Liege; 1640-1711) was a Belgian Golden Age engraver, painter and art theorist.Painter and etcher. Born at Liege, 1660 to Berlin, 1665 to Amsterdam; moved to The Hague around 1684. Condition: Very good, given age. Margins cropped to the image edge. Original folds, as issued. General age-related toning and/or occasional minor defects from handling. Please study scan carefully. Storage location: TPC-P1-17 The overall size is ca. 18.2 x 27.1 inch. The image size is ca. 18.2 x 27.1 inch. The overall size is ca. 46.2 x 68.9 cm. The image size is ca. 46.2 x 68.9 cm.